Cologne Archbishopric Electorate German: Erzstift Köln, Kurköln 953–1803 Electoral Rhenish Germany Prince-elector and Arch-Chancellor of Italy. Duke of Westphalia since 1180. Cologne became a Free Imperial City in 1288. 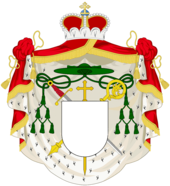 Mainz Archbishopric Electorate German: Erzbistum Mainz, Kurmainz c. 780–1803 Electoral Rhenish Germany Prince-elector and Arch-Chancellor of Germany. French: Archevêque Trèves 772–1803 Electoral Rhenish Germany Prince-elector and Arch-Chancellor of Burgundy. Augsburg Bishopric German: Hochstift Augsburg c. 888–1803 Swabian Germany Augsburg became a Free imperial City in 1276. German: Erzstift Besantz None France The archbishops had been rulers over Besançon, an Imperial city from 1307, which in 1512 joined the Burgundian Circle. Brandenburg Bishopric German: Hochstift Brandenburg c. 1165–1598 Upper Saxon Germany Founded in 948, annihilated 983, re-established c. 1161, continued by Lutheran administrators after Reformation in 1520, secularized and incorporated to the Margraviate of Brandenburg in 1571. Bremen Archbishopric German: Erzstift Bremen 1180–1648 Lower Saxon Germany Continued by Lutheran administrators after Reformation in 1566 until 1645/1648. Bremen itself became autonomous in 1186, and was confirmed as a Free Imperial City in 1646. Brescia Bishopric Italian: Principato vescovile di Brescia None Italy Bishop Notingus was made count of Brescia in 844. Lower Silesian: Brassel None Poland In 1344 Bishop Przecław of Breslau (present-day Wrocław) bought the town of Grottkau (Grodków) from the Silesian duke Bolesław III the Generous and added it to the episcopal Duchy of Neisse (Nysa), becoming Prince of Neisse and Duke of Grottkau as a vassal to the Bohemian Crown. German: Bistum Lausanne 1270–1536 None Switzerland Conquered by the Swiss city canton of Bern in 1536. Lübeck Bishopric German: Hochstift Lübeck 1180–1803 Lower Saxon Germany Seated in Eutin since the 1270s; Reformation started in 1535, continued by Lutheran administrators since 1586 until secularization in 1803. Lübeck became a Free Imperial City in 1226. Magdeburg Archbishopric German: Erzstift Magdeburg 1180–1680 Lower Saxon Germany Continued by Lutheran administrators between 1566 and 1631, and again since 1638 until 1680. Merseburg Bishopric German: Bistum Merseburg 1004–1565 None Germany Administered by the Lutheran Electorate of Saxony between 1544 until 1565. German: Hochstift Metz 10th century–1552 Upper Rhenish France One of the Three Bishoprics ceded to France by the 1552 Treaty of Chambord. Naumburg Bishopric German: Bistum Naumburg-Zeitz Germany Under guardianship of Meissen from 1259, administrated by Saxony from 1564. German: Bistum Olmütz None Czech Republic The Czech bishopric (later Metropolitan) of Olomouc, as a vassal principality of the Bohemian crown, was the peer of the margraviate of Moravia, and from 1365 its prince-bishop was 'Count of the Bohemian Chapel', i.e., first court chaplain, who was to accompany the monarch on his frequent travels. Ratzeburg Bishopric German: Bistum Ratzeburg 1236–1648 Lower Saxon Germany Ruled by Lutheran administrators between 1554 and 1648. Regensburg Bishopric German: Hochstift Regensburg 1132?–1803 Bavarian Germany Regensburg became a Free Imperial City in 1245. Salzburg Archbishopric German: Fürsterzbistum Salzburg 1278–1803 Bavarian Austria Raised to an electorate in 1803, but simultaneously secularized; see Electorate of Salzburg. Since 1648, the archbishop has also borne the title Primas Germaniae, First [Bishop] of Germania. The powers of this title – non-jurisdictional – are limited to being the Pope's first correspondent in the German-speaking world, but used to include the right to preside over the Princes of the Holy Roman Empire. Schwerin Bishopric German: Bistum Schwerin 1180–1648 Lower Saxon Germany Ruled by an administrator between 1516 and 1648. Speyer Bishopric German: Hochstift Speyer 888–1803 Upper Rhenish Germany Territories to the east of the Rhine were annexed by France in 1681, confirmed in 1697. Speyer became a Free Imperial City in 1294. German: Bistum Toul 10th century – 1552 Upper Rhenish France One of the Three Bishoprics ceded to France by the 1552 Treaty of Chambord, confirmed in 1648. German: Fürstbistum Trient 1027–1803 Austrian Circle Italy Secularized to Tyrol in 1803. Utrecht Bishopric Dutch: Sticht Utrecht 1024–1528 Lower Rhenish / Westphalian Netherlands Sold to Charles V, Holy Roman Emperor in 1528, after which it was moved to the Burgundian Circle. Founding member of the Dutch Republic in 1579/1581, confirmed in 1648. 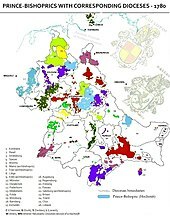 Verden Bishopric German: Hochstift Verden 1180–1648 Lower Rhenish / Westphalian Germany Continued by Lutheran administrators after Reformation until 1645/1648, when it was continued as a secular and independent principality until its disestablishment in 1807. It became a part of the Kingdom of Hanover in 1815. German: Bistum Verdun 10th century – 1552 Upper Rhenish France One of the Three Bishoprics ceded to France by the 1552 Treaty of Chambord, confirmed in 1648. Worms Bishopric German: Bistum Worms 861–1801 Upper Rhenish Germany Worms city rule established by Bishop Burchard (1000–25), episcopal residence at Ladenburg from 1400, held large estates in the former Lahngau region, territories left of the Rhine lost by the 1797 Treaty of Campo Formio, secularized at first to French Empire, finally Baden and Hesse-Darmstadt in 1815. 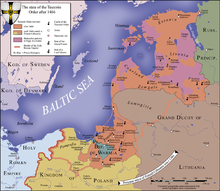 Low German: Bisdom Curland Terra Mariana Latvia Established about 1234, the smallest of the Livonian dioceses. Secularized in 1559 and occupied by Prince Magnus of Denmark. From 1585 under the suzerainty of the Polish–Lithuanian Commonwealth, part of the Duchy of Livonia. To Russia in the 1795 Third Partition of Poland. Low German: Bisdom Dorpat Terra Mariana Estonia Bishop Hermann, appointed by his brother Bishop Albert of Riga, received the title of a prince-bishop by King Henry VII of Germany in 1225. Dorpat (Estonian: Tartu) remained a suffragan diocese of Riga. Dissolved in the course of the Protestant Reformation in 1558. Low German: Bisdom Ösel-Wiek Terra Mariana Estonia Established on Saaremaa island in 1228 under Bishop Gottfried, appointed by Bishop Albert of Riga, vested with the title of a prince-bishop by King Henry VII of Germany. It remained a suffragan diocese of Riga. Dissolved in the course of the Protestant Reformation in 1559. Low German: Erzbisdom Riga Terra Mariana Latvia Episcopal see at Üxküll 1186–1202. 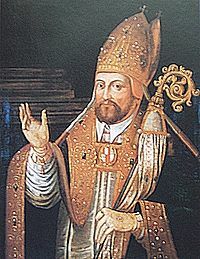 In 1225 Albert of Riga received the title of a Prince-bishop of Livonia by Emperor Frederick II. Last Archbishop William of Brandenburg resigned in 1561 during the Livonian War, territory fell to the Polish–Lithuanian Commonwealth, to Sweden in 1621. Polish: Biskupie Księstwo Warmińskie Prussia Poland Established by Papal legate William of Modena in 1243, princely title documented in the Golden Bull of 1356. Incorporated into the Jagiellon kingdom of Poland in 1466 and re-established as an autonomous prince-bishopric under the Polish crown in 1479. Abolished in the course of the Prussian annexation in 1772 during the First Partition of Poland. This page was last edited on 25 February 2019, at 23:49 (UTC).